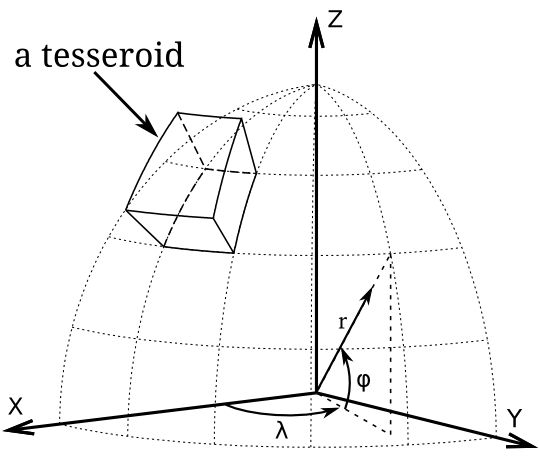 Tesseroids is a collection of command-line programs for modeling the gravitational potential, acceleration, and gradient tensor. Tesseroids is developed by Leonardo Uieda in cooperation with Carla Braitenberg. If you use Tesseroids in your research, please consider citing it in your publications. See Citation for more information. As of version 1.1, Tesseroids is available under the BSD license. This means that it can be reused and remixed with fewer restrictions. See the license text for more information. The source code of Tesseroids is hosted on GitHub. There you can browse the code, create your own fork, and start contributing! Get in touch to see how you can help. This documentation explains how to install and use Tesseroids. It also contains some theoretical background to get you up-to-date with the terms and equations that we use. The cookbook has a few example recipes and the expected output (I recommend starting here if you just want a quick peek). © Copyright 2012-2014, Leonardo Uieda.